In a community where renewables have provoked backlash, expo offered a showcase for clean energy entrepreneurs, advocates. Renewable energy is still a controversial topic in Floyd County, Virginia, but solar-baked chocolate chip cookies? Not so much. Children huddled around Alex Haney, a project manager for Affordable Energy Concepts, as he slid a spatula into a black box ringed with reflective panels and scooped out a perfectly baked chocolate-chip cookie. The solar oven was a crowd-pleaser at the second annual Floyd Energy Fest, which gathered clean energy advocates, utilities, and entrepreneurs at a rural farm atop the Blue Ridge Plateau in eastern Appalachia. In a community where wind turbines and other renewable energy have provoked backlash, the Floyd Energy Fest offered an apolitical venue to talk about solar panels, electric vehicles and other energy technologies. As part of Appalachian Virginia, two-thirds of Floyd County consistently votes Republican in elections. The rural, mountain county also is home to a progressive community that grew out of the “back-to-the-land” movement of the ’60s and ’70s. The result is a vibrant, entrepreneurial culture with an emphasis on self-sufficiency. The juxtaposition of traditional and alternative lifestyleshas also produced a cultural clash that has bled into politics, including how county government addresses climate change. In 2017, a coalition of local environmental and civic groups presented the county board of supervisors with a draft resolution that called for more use of renewable energy. Alan Maurer of Baseline Solar in Blacksburg, Virginia, speaks with attendees at the 2018 Floyd Energy Fest. That fight through last summer and fall served as an unstated backdrop to the Floyd Energy Fest, but political division was largely absent. Present instead was the kind of enthusiasm found among the children hovering around Haney’s solar oven, as well as his other solar “toys.” One child moved his hand back and forth in front of a solar panel as others watched the corresponding effect on a water fountain it powered. Another panel powered a fan that cooled people on a sweltering day when temperatures hovered in the 80s. The rural energy fest spun out of a larger energy expo in nearby Roanoke, western Virginia’s largest metro area. The smaller Floyd Energy Fest included three dozen displays and about 200 attendees in a rural county of about 16,000. Billy Weitzenfeld, executive director of the Association of Energy Conservation Professionals (AECP) and president of SustainFloyd, which sponsored the festival, said he prefers the newer iteration: there may be fewer people, but there’s more meaningful engagement between them. During a delay in the proceedings when a presenter misplaced a jump drive, for example, Weitzenfeld fielded questions from a couple of dozen people. He touted the federal solar tax credit, which allows the deduction of 30 percent of the cost of installing a solar energy system. Someone asked about Appalachian Power, which along with a few smaller municipal utilities supplies most of the electricity in southwestern Virginia. Haney noted three general types of people he’d met that day: potential customers seeking information; people seeking smaller systems for an RV or tiny house; and those just curious to learn more about renewable energy. Earl White of Big Indian Farm approached Haney with questions about outfitting 14-foot-by-14-foot cabins for his three sons with solar power. White is yet another Floyd County resident with his own business, operating a bakery and farm store with his wife in Indian Valley, a community in the county’s western end. White clearly had already done some research on solar generation, but was looking for more information from the multiple solar vendors and advocates at the festival. 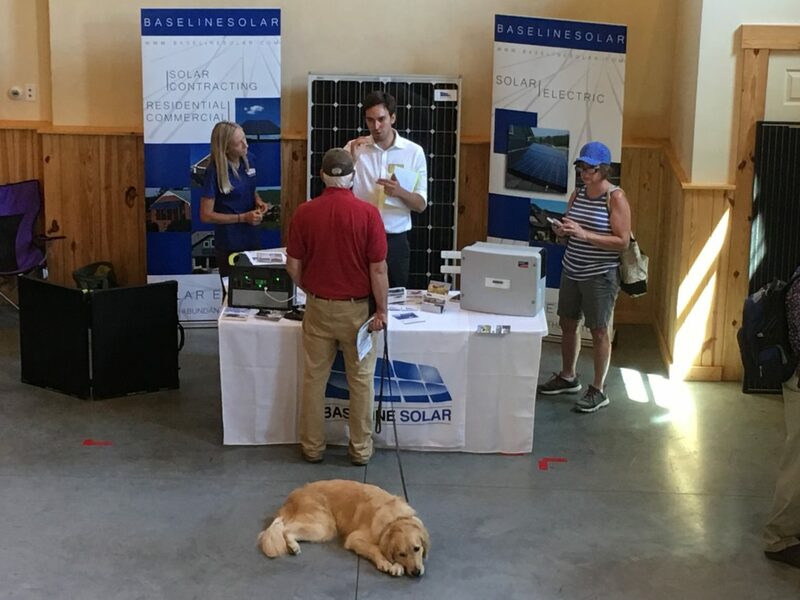 Other solar installers, such as Rick Brown of SolShine Energy Alternatives in Floyd County and Alan Maurer of Baseline Solar in Blacksburg, also used booths at the festival to educate the curious and court potential customers. All were taking a “wait-and-see” approach to Virginia’s sweeping new energy law, which would appear to encourage more development of solar generation but in a way that benefits utilities building large projects more than residential customers investing in smaller units. None seemed worried about federal tariffs on Chinese goods increasing the price of solar panels, saying they expected a small price increase at worst. Bigger companies and utilities such as U.S. Cellular and Appalachian Power ran booths as well, but the festival’s bread-and-butter were small advocates, stakeholders, and entrepreneurs hustling for a piece of the clean energy industry. One vendor that occupied the middle ground on that spectrum was Apex Clean Energy, a Charlottesville company with about 220 employees that has developed 2.2 GW of wind projects in Illinois, Oklahoma and Texas, with more than twice that planned for the near future. The company has proposed two projects in western Virginia: Botetourt County’s Rocky Forge Wind, a 25-turbine, 75 MW wind farm, has received county and state permits, and the company is seeking customers to buy power. Farther southwest in Pulaski County, Apex is still beginning the process of winning support and permits for Pinewood, a 150-MW wind farm with 30 to 40 planned turbines on land owned by the Boy Scouts of America. Apex hopes to have the projects operational by 2019 and 2020, respectively. Charlie Johnson, a development manager with Apex Clean Energy, said the company was at the festival for community engagement around both projects. So far as finding customers, it is closely watching the private sector. Mark Hanson of the Renewable Energy & Electric Vehicle Association showed off his Chevrolet Spark at the 2018 Floyd Energy Fest. Besides businesses, advocates like Mark Hanson ran booths. 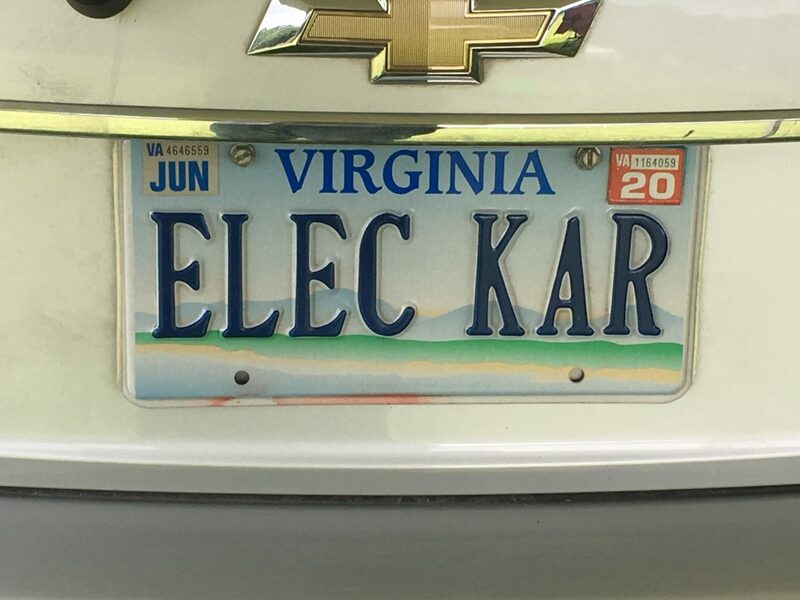 As president of the Renewable Energy & Electric Vehicle Association, Hanson showed off his Chevrolet Spark, with its “ELEC KAR” vanity license plate, and answered questions about technology and the regulatory and utility ins and outs of acquiring solar generation for one’s house. Through REEVA, Hanson has guided dozens of people through the process, and he knows the blueprint for getting approval. Amidst these wonks and entrepreneurs were the curious and crusading. One person handed out “No Fracking Pipeline” stickers opposing the nearby interstate Mountain Valley Pipeline now under construction. Others tried to wrangle their kids, who got their faces painted, sought out solar-powered bugs, and played with the solar “toys” on display near Haney’s solar cookie oven. For the children, those toys made for a fun way to pass the time. For clean energy advocates in Floyd County and Virginia, they represent a potential future for rural America.